This year Kajari teej is on 29th August 2018 – Wednesday. Kajari teej is an important festival celebrated in many northern states of India, but is of special significance to the Marwari community. It is celebrated by all the Maheshwari families. Some Agrawal and Rajasthani families also celebrate this festival. I have already shared the recipe of Chana ka sattu. 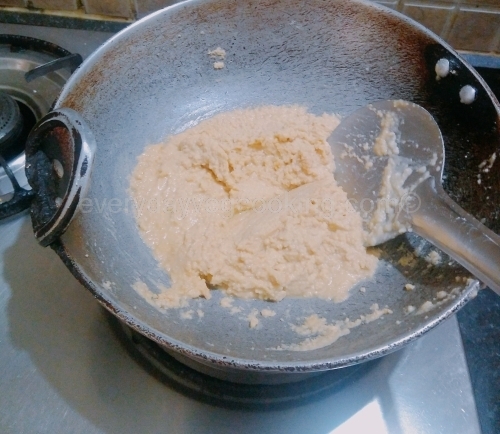 Today I am sharing the recipe of maida ka sattu. It is a very delicious mouth-watering sweet delicacy. The recipe might seem a bit lengthy, but it is very simple and easy, nevertheless. Maida being a refined flour, is very fine and so the sattu made with it will stick to the palate while eating. In order to overcome this, its texture has to be made a little coarse. This is a simple process, which is called mogri dalna in Hindi. I will describe it in the recipe. Mix 3 tbsp melted desi ghee and 2 tbsp warm water. Take maida in a plate, add the warm mixture of desi ghee and water to it. Mix it lightly with the fingertips. Now press the mixture tightly and form a small pyramid-like shape. Cover and keep it for rest for 20 minutes. Now crumble the pyramid with hands. Take the mixture in medium hole sieve. Now rub the mixture with palms and sieve it. Chop 5 to 7 badam, reserve remaining badam to fix on pindi. 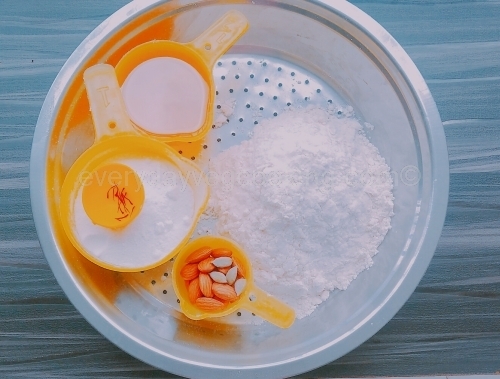 Soak kesar in 1/2 tsp warm milk and crush it. Heat 100 ml melted desi ghee in a heavy bottom kadhai. Add coarse maida to it and roast it on medium-low heat till maida is pinkish in colour, at this stage very nice aroma is obtained and maida will start releasing ghee. Add chopped badam, mix well and switch off the flame and let the mixture cool. When mixture is slightly warm, add bura and cardamom powder and mix well. 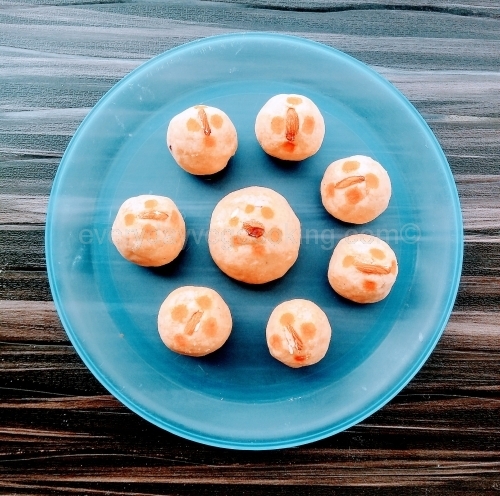 To check the perfect consistency of the sattu mixture, make one small laddu and if it binds together and laddu does not break, the mixture is ready to make pindi. Now grease your palms with ghee, take sufficient portion of maida mixture and shape it into pindi, fix one badam in the centre of pindi and keep it aside. 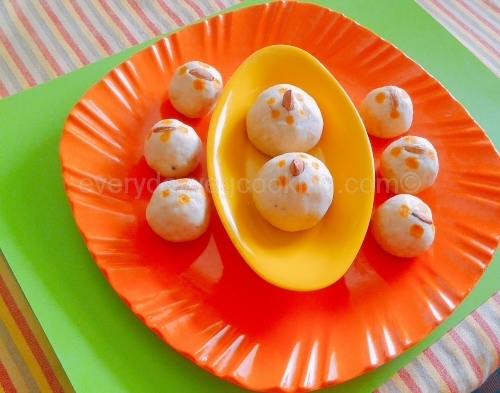 Garnish sattu with kesar as desired, you can also make swastik on sattu. Delicious maida ka sattu is ready to celebrate Kajari teej, enjoy this festival with family and friends. Happy kajari teej to all of you. Instead of badam you can also use puja wali small supari to fix on top of pindi. Aha thats delicious. Wish to try it out.